Good communication can mitigate the loss from ongoing leakage of IT spend, such as on changes to systems of little value; a rhythm of IT-business rapport can free up value. How well does your organization communicate across functions and between levels regarding technology priorities? In most organizations, communication is lacking. Goals are communicated at a high level, but how they are applied is spotty. 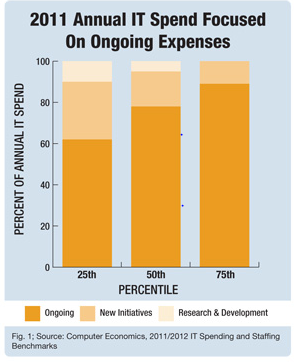 This leads to organizations spending more on their IT operational and maintenance budgets than desiredComputer Economics reports that the average company in 2011 spent 75 percent of its IT budget on ongoing expenses and only 25 percent on new initiatives and research and development. (See Fig. 1.) Some organizations are able to reduce their ongoing spend to 50 percent, freeing money for strategic technology investments. Generally, governance processes manage large dollar spending, but companies are less disciplined regarding ongoing IT spend, which is where leakage occurs and good communication can mitigate the loss. Leakage is effort spent on changes to systems that add little value. It occurs where the functional and technology teams prioritizing minor changes or enhancements are doing their best to apply strategic goals to tactical activities. Often the work is eight or 10 hours of programming to add a user preference that advances no goals. Minor enhancements, part of ongoing IT spend, add up but could be avoided or mitigated with better knowledge of management priorities.